Instant Pot Beef Stew is a quick and hearty meal your family will love. Tender meat, creamy potatoes, and the rich thick broth are so delicious! Using an Instant Pot is my favorite way to make beef stew. I’ve made plenty of stew recipes on the stove top and the slow cooker, but using the Instant Pot is far superior. It is faster and the food is more flavorful. Believe me, once you make Instant Pot Beef Stew, you’ll never cook it any other way. 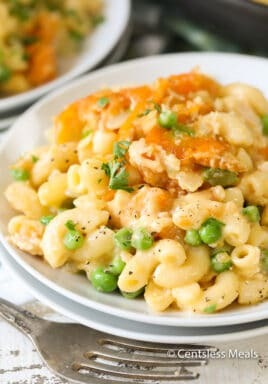 Pin it to your INSTANT POT BOARD to save it for later! 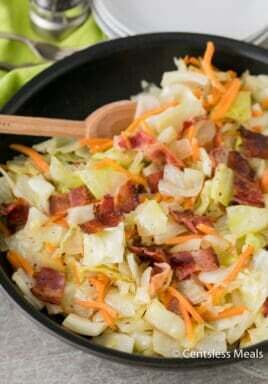 Not only does cooking in the pressure cooker save you time, but the flavor, tenderness, and moisture level far exceeds other cooking methods, especially when it comes to things like soups and stews. If you’re new to the pressure cooking world, just know that you can make so many recipes from things like this beef stew, to Honey Garlic Chicken, to Beef Stroganoff. My Instant Pot is one of the most used appliances in my kitchen! Beef Stew is Comfort Food! 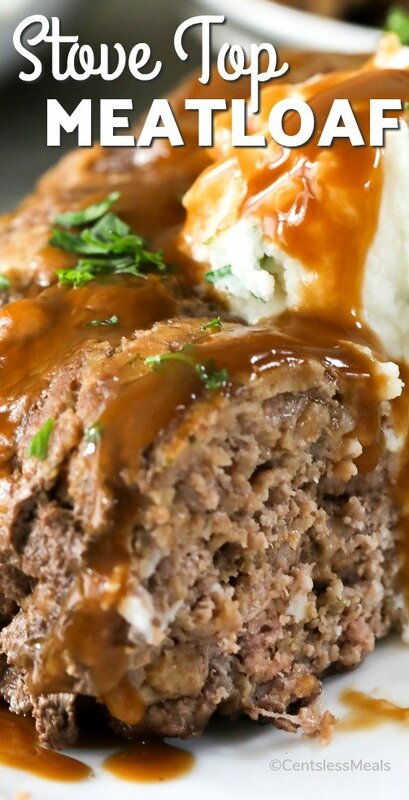 This savory meal has everything a good old fashioned comfort meal should have. Like a good bowl of chicken soup, you’ve got everything you need in one piping hot bowl – protein, vegetables, and carbohydrates. 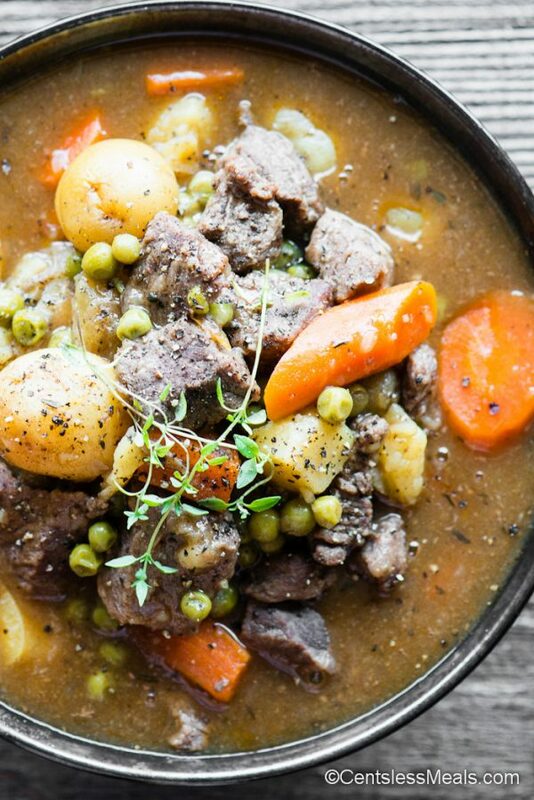 This beef stew pleases all kinds of eaters. Like to have a little bit of everything in each bite? You got it. Want to mop up the last bit with a warm crusty piece of bread? Dive right in. Not only does this Instant Pot Beef Stew satisfy all hunger pains, but everything about it is wonderful. Especially as the days start to get colder and darker. You can brown the stew meat right in the Instant Pot. This process only takes a few minutes, but browning the meat adds excellent flavor and texture in the finished stew. Most slow cookers don’t have this ability. Pressure cooking is quick. A good stew on the stove top or in a crockpot can take hours. Since I’m usually scrambling to figure out what to make for dinner each night, I like knowing that start to finish, I can have a homemade beef stew on the table in well under an hour. Flavor infused meat. Any time you make a recipe that cooks meat in liquid, the pressure cooker should be your go-to appliance. All the flavor gets infused into the meat, and this stew meat will be the most tender you’ve ever enjoyed. You can control the doneness of your meat and vegetables. When you’re experimenting, this can take some trial and error. Fortunately, with this Instant Pot Beef Stew recipe, I’ve already figured the perfect cooking time for both the meat and the vegetables! 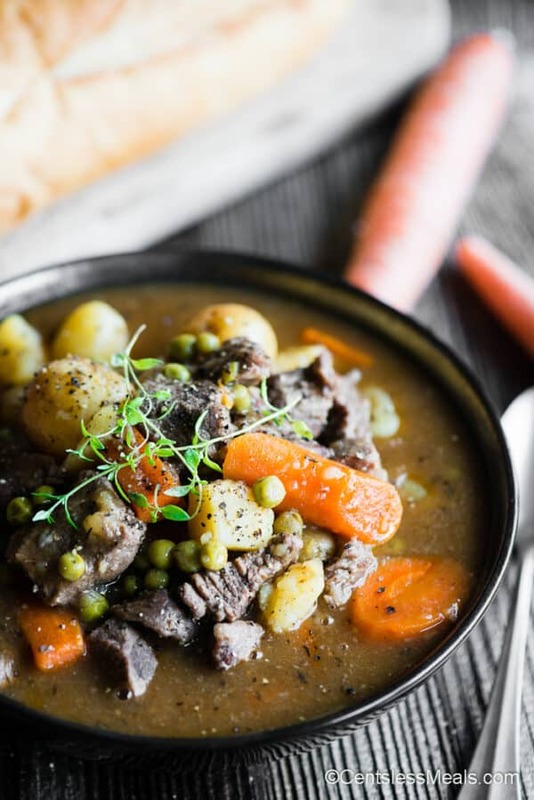 You simply must give this Instant Pot Beef Stew recipe a try! The meat is so tender, the vegetables are cooked perfectly and the flavor is absolutely wonderful! If your friends and family were not stew fans before, they definitely will be now! 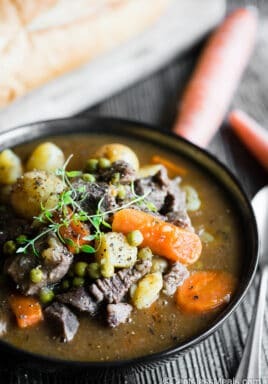 Not only is this Instant Pot Beef Stew a super quick recipe, but the beef is so tender, the vegetables are cooked perfectly and the flavor is absolutely wonderful! If your family were not stew fans before, they definitely will be now! Set the Instant Pot to Saute mode then add the oil. When the oil is hot, add half the meat in a single layer and allow it to brown, turning only once, for about 5 minutes. Transfer to a large bowl and add remaining stew meat and allow to brown for about 5 minutes. Transfer to same bowl. Add the onions and allow to brown on Saute mode for about 5 minutes, stirring only occasionally. Add minced garlic and tomato paste, stir, and allow to cook for an additional minute. Add browned meat and any juices from bowl along with Worcestershire sauce, salt, thyme and beef broth. Cover and lock lid. Set to high pressure for 10 minutes. Quick release pressure, then add the potatoes, carrots and peas. Lock lid, and cook on high pressure for another 10 minutes. When stew is done, quick release the pressure. Add a couple tablespoons of the hot broth to a cup and add corn starch to the cup to make a slurry. Once all the corn starch has dissolved, stir the slurry into the stew. The broth should thicken a bit. If you prefer your stew extra thick, you can use a potato masher to mash up some of the vegetables. Add additional salt and some pepper, to taste. 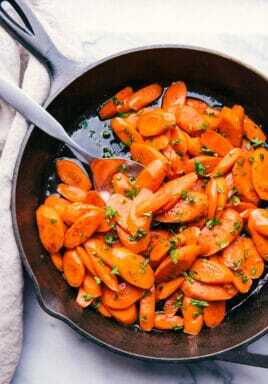 Serve with a nice green salad and some hot crusty bread. 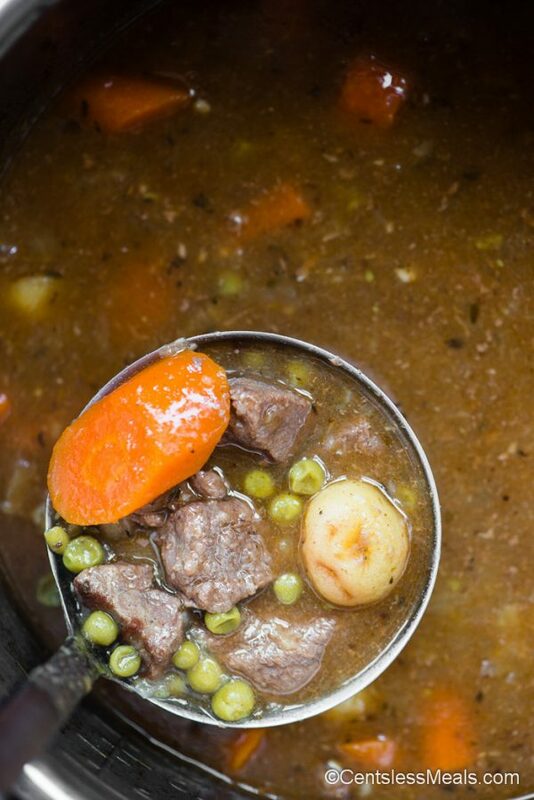 REPIN this Quick Stew Recipe! Krissy is married to the Leftover King, has two food-loving kids, and lives on a 10 acre farm with 5 goats, 22 chickens, and one barn cat named Barn Cat. Krissy left a life in the suburbs and a career in the high tech industry that spanned almost two decades to devote all of her time and energy to her family, recipe creation, photography, and eating. You can find hundreds of delicious recipes on her blog, Self Proclaimed Foodie, and you can read about her farming adventures and mishaps on her new, more personal blog, Ten Acre Baker.